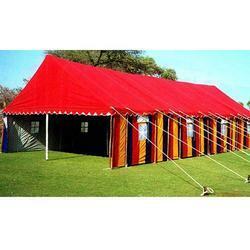 Marquee Tents, Size: 15x28 Sq. Ft.
Owing to the dedication of experts and professionals, we are paramount in proffering excellent quality array of Navrattan Marquee Party Tent in many sizes. This canvas marquees is a hut shape marquee, which is used for weddings parties, get together, large gatherings, conferences and fairs, etc. The roof of the canvas marquees is manufactured of qualitative two-layer water repellent cotton. This is available in natural colors, with inner linings of printed cotton sheeting. We make Inner linings to give beautiful Indian interiors to your existing Marquees.The inner prints are block printed in the traditional Indian manner on cotton fabrics to give beautiful interiors to Large PVC Marquees. We give velcros / cotton tapes to tie the lining to the frame of your Marquee. We are a leading exporter of tent marques or cabin tents or canvas tents that are manufactured at our advanced manufacturing unit. 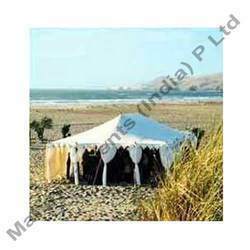 We are offering Marquee Tent. Stylish marquee tent for all occasions.